REI is a great example of a brand with a purpose. REI’s purpose is simple and powerful. “At REI, we inspire, educate and outfit for a lifetime of outdoor adventure and stewardship. REI has earned a place on Fortune’s “100 Best Companies to Work For” every year since the rankings began in 1998. REI is another company that treats their employees well and this leads to a great shopping experience with excellent customer services. This is a simple formula. I am surprised that more retailers don’t execute this strategy. A further endorsement of the power of purpose, last week President Obama nominated REI Chief Executive Officer Sally Jewell as the Secretary of the Interior. I think Sally’s nomination is a great move for this country. REI and its employees are passionate about the outdoors. They share their enthusiasm for the products they sell, and the trails, slopes and waterways where they explore. Each year, REI donates millions of dollars to support conservation efforts nationwide and sends dedicated teams of volunteers – members, customers and employees to build trails, clean up beaches and more. REI employs responsible business practices across the company that are designed to reduce their environmental impact. REI is privately held and organized as a consumer’s coop. REI believes in the importance of building a closer connection with customers through a membership program. REI sells a lifetime membership for $20. Members receive a 10% annual dividend based on their purchases as well as other discounts and special offers. There are over 5 million REI members today. REI is also an innovator in social media. This past holiday they created a program where they answered consumer’s product questions on Twitter with video. If you get a chance visit an REI store, it is a great experience. REI is brand that lives its purpose every day. Have you ever shopped at an REI store? 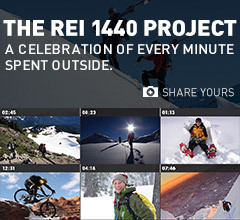 I just checked the REI 1440 project site – it’s just such a cool site! Thanks for sharing.